Federal estate taxes get all the press. But don’t forget that Illinois has an estate tax too. And, to be honest, the Illinois estate tax is one of the most misunderstood things in estate planning. We frequently get questions about how it works…even from other Illinois estate planning attorneys. The federal estate tax is pretty straightforward. You can gift or pass on up to the exemption amount (currently $5.12 million but scheduled to go down to $1 million in 2013) without paying any taxes. If your estate is larger than the exemption amount, you pay taxes only on the excess. Calculating federal estate taxes is a simple matter of subtracting the exemption amount ($5.12 million) and multiplying the remainder by the tax rate (currently 35%). 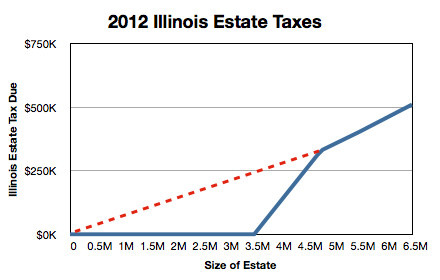 andWe prepared an Illinois estate tax chart to highlight how the exclusion works for different estate sizes. A good picture can often make a point much more clearly than paragraphs of the best explanation. The blue line shows the estate taxes due (these figures were obtained from the Illinois Attorney General estate tax calculator). As you can see, no Illinois estate taxes are due until an estate exceeds $3.5 million (the amount of the 2012 Illinois estate tax exclusion). But once an estate hits that mark, Illinois taxes shoot up like a rocket. Then, around $4.8 million, the taxes level off. The red line is a continuation of that part of the blue line above $4.8 million. It is there to show what the taxes would have been in the absence of the exclusion. The straight line starting at zero and continuing on through the blue line tells us that the taxes at and above $4.8 million is a flat percentage of the entire estate, not just the amount of the estate over $3.5 million. Let’s see how that works in practice. In 2011, the Illinois exclusion amount was $2 million. In 2012, that amount was raised to $3.5 million. So that means a person can pass on an additional $1.5 million to their heirs tax free in 2013, right? It’s easiest to see by looking at an example. We’ll use an estate size of $5 million because that is the amount of the federal exemption from 2011. Yes, you read those numbers correctly! The taxes owed on a $5 million estate are exactly the same regardless of whether the exclusion amount is $2.0 million or $3.5 million. The convergence point seems to be around $4.8 million. Below that amount, an estate will owe less taxes under the 2012 rules than under the 2011 rules. But for any estates over that amount, the Illinois estate taxes didn’t change with the increase in the exclusion. If your estate is between $2 million and $3.5 million (or from $4 to 7 million for a couple with the proper estate planning to take advantage of both spouse’s exclusion amounts), you can rest easy. The increase in the exclusion amount saved your future heirs lots of money in Illinois estate taxes. But if your estate is above $4.8 million (or $9.6 million for a couple with the proper estate planning) the increase in the exclusion amount didn’t reduce your estate taxes by even a single penny. The good news for everyone with an estate over (or even close to) $3.5 million (or $7 million for couples) is that estate tax reducing strategies are available. The best medicine for treating estate taxes is a good strategy + time to make it work. Most seniors who spend significant time (months or years) in a long-term care facility end up relying on Medicaid at some point during their stay. Nursing home costs can be a crushing burden, one that most seniors can’t shoulder alone for long. Medicaid qualification has always been tough. But seniors have usually been able to protect a few assets for their spouse or children, or to supplement their own care, on their way to getting Medicaid assistance. Now, though, Illinois has implemented harsh new rules required by the Deficit Reduction Act of 2005 (DRA), a federal law that governs the state Medicaid programs. These new rules apply to any Medicaid long-term care applications filed in Illinois after January 1, 2012. If you’re close to retirement age, or have a parent or loved-one close to retirement age, knowing how these new rules work is critically important. The changes are so big that we’ll need to cover them in several parts. This first part deals with two concepts that our clients usually encounter first when researching Medicaid — “look back” and “penalty periods“. The rules for both have changed dramatically. And the changes could cost unprepared Illinois seniors tens of thousands of dollars in lost Medicaid long-term care benefits. The old Medicaid rules required applications to be filed with three years of the applicant’s financial history, including bank records, tax returns, and information about sales or gifts of assets. Anything that occurred more than three years prior to filing did not have to be disclosed for the most part. Applications filed on January 1, 2012 or later must include five years of financial history. That’s a big change (66% more), and when combined with the penalty period changes below, it makes planning for Medicaid much more complicated than under the old rules. The primary purpose behind reviewing five years of financial history is to determine whether the applicant made any disallowed transfers. Gifts, of course, are considered transfers. But so are many other things that people often do, such as reimbursing family members for groceries or paying them for helping around the house. When disallowed transfers are found, a penalty period is imposed. While under a penalty, a senior is denied Medicaid benefits — even though they might otherwise qualify. The senior must find another way to pay for the care until the penalty is over. That can be difficult when the assets gifted or transfered can’t be recovered. The new Medicaid rules made significant changes to the way penalty periods are calculated and applied. The old rules treated every month with a disallowed transfer independently. So the penalty for a $6,000 transfer in January was separate from the penalty for a $500 transfer in February. This generally worked out in favor of the senior because of how the other penalty rules worked. Small transfers spread among many months often didn’t even create a penalty at all. Under the new rules, all disallowed transfers from the past five years are added together to calculate the penalty. So very small transfers (even just a few hundred dollars) — if they are made regularly — can result in a huge penalty when added together. The length of the penalty period for a disallowed transfer is equal to the value of the transfer divided by the monthly private pay rate for the nursing home the senior resides in at the time of the application. For example, a $9,000 transfer with a private pay rate of $5,000 results in a 1.8 month penalty. The one month penalty is pretty easy to understand. But happens to that fractional 0.8 months? Penalties under the old Medicaid rules were calculated in whole months. And fractional months weren’t rounded using the rules we were all taught in grammar school (round up 0.5 and above and round down anything lower). Instead, fractions were simply dropped. So a 1.8 month (or 1.9 month) penalty was applied as a 1.0 month penalty. This obviously left open up all sorts of doors for creative asset protection. But those doors have now been closed. Fractions are no longer rounded down. Penalties are calculated and applied to the half of a day. A penalty of 1.8 months will be applied as a 1 month and 24 day penalty. Applications under the old rules were often simplified by the fact that penalties were applied in the month of the transfer. Imagine that a $15,000 transfer was made 24 months before applying and that the nursing home private pay rate is $5,000 per month. Under the old rules, a three month penalty would have been applied beginning in the month of the transfer. That means the penalty ended 21 months ago — in other words, long before Medicaid coverage was actually needed! Under the new rules, the penalty starts only after the senior applies for Medicaid and meets all of the other qualification requirements. As you can see, even fairly large transfers made many months (or years) before applying weren’t likely to cause problems under the old Medicaid rules. Taken individually, the changes to penalty periods sound quite harsh. But you really need to see an example to fully understand just how much the new rules will affect seniors. Mary has been in good health and financially secure for years. And she has been generous with her money. Every year at Christmas, Mary gives $100 to each of her seven grandchildren. A couple of years ago, Mary also gave $4,500 to her daughter, Susan, to help Susan through a period of prolonged unemployment. Recently, though, Mary’s health has declined and she is now residing in a nursing home that costs $5,000 per month. The rest of Mary’s assets have been spent, and she is now looking to Medicaid for her long-term care needs. Everything Mary did is what many other grandparents would do — and have done — in the same situations. But the Department of Healthcare and Family Services won’t look at what Mary did in the same light. Under the new Medicaid rules, Mary made $700 worth of disallowed transfers each year (the Christmas gifts) plus a single disallowed transfer of $4,500 (the gift to Susan). Adding up five years worth of transfers (remember, there is now a five year look back period) brings the total to $8,000. The Department of Healthcare and Family Services will apply a 1.6 month penalty to Mary ($8,000 in transfers divided by the $5,000 private pay rate). Mary’s nursing home will be looking to someone else to pay for Mary’s care during the penalty period. The new Medicaid rules have been described by some as “harsh”. But that may be an understatement. Completely ordinary behavior will now be penalized. As a result, it is imperative that Illinois seniors suffering from declining health get counsel from an elder law attorney to make sure that they aren’t damaging their Medicaid eligibility.